After sleeping the sleep of the dead and being woken up very our very cute alarm clock jumping on our tummies (thanks Oscar!) we got ready to face the open road again. Not a bad road, either. Our destination was Mikey's old stomping ground - The Coromondel peninsular - but just had to stop off in Paeroa the birth place of my new favourite drink L&P. Despite not being made here anymore (your friendly neighbourhood coca cola company now owns the production) they have commemorated the history of this place with a giant bottle. Yay! Oh, and a bin shaped like a lemon. Deciding that Paeroa didn't quite look like a place we wanted to spend hours on end we carried on with our drive. Our journey took us up the Thames coast and it wasn't hard to see why Top Gear chose this road for Jeremy Clarkson to drive on when they filmed over here. We'd watched the episode on our flight over in preparation, and were very excited to spot locations. Check out highway 25 on google maps, it's quite incredible. It was pretty much on the beach for the entire way, which can apparently prove quite tricky during storms! We were able to see right across the Firth of Thames and laugh at the suckers being drenched on the other side. The camera got some serious use, with ridiculously amazing views on every corner. The Coromandel is famous for it's sea food and you can spot lots of mussell farms in the ocean. We snuck in to a loading yard in the Te Kouma harbour, and saw a staggering amount being lifted off boats and in to trucks. Yum! This is the delightfully named Sugarloaf Wharf and each of those bags holds over a tonne of mussells. Apparently the weather was pretty much perfect on our visit, and I was genuinely surprised at how blue the ocean was. Australia, it seems, doesn't own the monopoly on beautiful antipodean beaches. Ever since I've met Mikey he'd talked about an amazing smoked seafood shop, The Coromandel Smoking Co. He used to drive over the hill from Whitianga and eat so much he'd get a tummy ache. Well, that was lunch sorted! Yep, I definitely understood why I'd heard so much about it. This was seriously good seafood. It's tempting to book another holiday simply so I can eat more of it. Despite how much I love Mikey there was no way I was letting him eat the last scallop. We enjoyed our lunch on the balcony of The Anchor Lodge, our perfectly quaint hostel/hotel. It was just out of town and was just the cutest little place. It even had a heated pool and hot tub...bliss. But before we relaxed it was time to explore the area. This is the incredible Wyuna Bay. It does actually have mud flats, but we timed it right and arrived for high tide. Rather than ugly mud we were greeted with crystal water and blue skies. Seriously, look how clear the water is. Mikey had bought me a lovely greenstone necklace (a very traditional Kiwi gift), but I hadn't been allowed to wear it until it had been dipped in the ocean. You are supposed to get jewellery like it blessed by a Maori elder, but unfortunately we didn't have one to hand so a quick dip in the water sufficed. I was very happy to be allowed to wear my necklace! The Coromandel is very famous for it's scallops and even hosts a festival for the season each year. I'm told it's not uncommon to come back up after a scuba dive with a few snacks in your BCD pocket... I found this perfect shell specimen and it's now got pride of place on our window sill. Eager to feast our eyes on more gorgeous scenery, we scampered up to a look out point and absorbed the view. We drove around like pensioners on a Sunday, mostly retracing Jeremy Clarkson's steps, and then decided it was time for more Speights. Not only did I buy Mikey Speights, I also got him some 'Sniks' (skins backwards!) port scratchings. Best girfriend ever? I think so. We, naturally, had to have a dip in the hot tub. Although we did regret not bringing our beers with us! After tarting ourselves up a bit (read: having a quick shower and drinking some Speights) we were off to the Pepper Tree restaurant for some proper fancy pants food. Because by this point it was easier to just accept our alcoholism we ordered a bloody mary oyster shot each as our starter. Now, I love Bloody Mary's. I love oysters. So it was no surprise that when someone combined the two I'd be rather keen. Thankfully, as one oyster isn't that filling, our main turned up soon after. I think Mikey's face adequately conveys our emotions when it arrived. Need I say more? Didn't think so. It's not hard to see why the area is so famed for it's seafood! The scallops were honestly one of the nicest things I've ever eaten. Honestly, I could just come here and eat every day until I exploded Mr Creosote style. ...as we do on eating (leave no cheese behind). Oh, and yes, that is another oyster shot...oops! After our epic feast we were feeling rather sleepy; thankfully the temperature outside had dropped by about 13 degrees while we'd been eating so the fear of freezing to death woke us up. Our little room was so cosy and warm that it didn't take long for us to slip in to a deep slumber, dreaming of scallops and mussells dancing around our plate. Usually when my alarm goes off at 6.30am I'd be cursing every God I could think of, but the thought of more exploring had me hopping out of bed. We were off to the eastern side of the pensinsular and Mikey had promised to take us to places a little off the beaten track. The views we got certainly didn't disappoint! Then it was time to get off the main road for a bit...and on to some seriously patchy unsealed roads. I felt very sorry for poor Betty the car! The beaches were all gorgeous and totally unspoilt. Despite the weather being perfect our early start meant that we had everywhere to ourselves, or would have done if we hadn't had a friendly German backpacker from the hostel invite himself along! At least we had someone to take pictures of us posing! This is Otama Bay and I'm 'putting my hands up' because it's one of the locations for Macklemore's video for the single Can't Hold Us. And I'm cool. Apparently this rock really varies in height depending on how much sand has been washed on to the beach. I think Otama Bay was my favourite! Just look at that water! It's also the beach that Mikey officially passed his instructor course on...so of course he had to wear his Tusa t-shirt. For a couple of hours either side of low tide people flock to Hot Water Beach to dig themselves home made hot tubs! A hot spring emerges from under the sand and when the tide goes out you can dig your own little hole and watch as it fills up with hot mineral water. In the picture below you can see it literally bubbling up from under the ground. 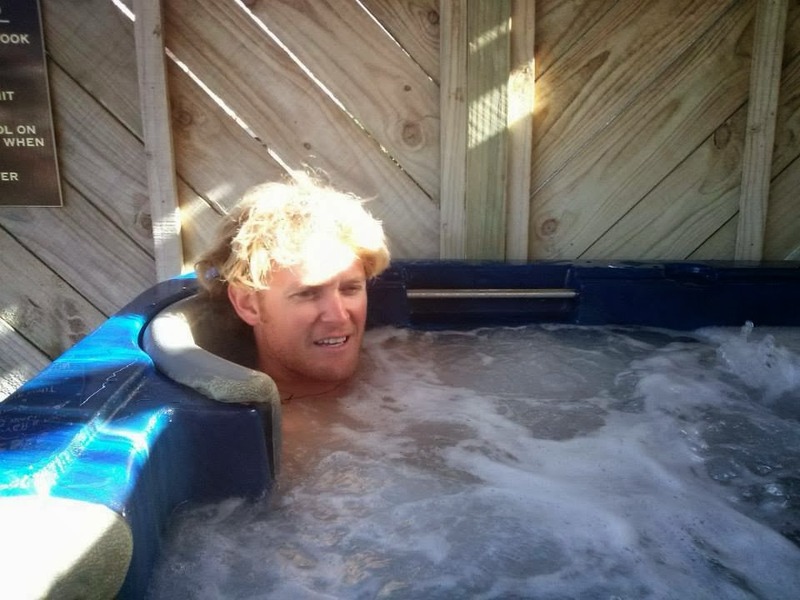 The name 'hot water' is slightly misleading...the water is actually boiling and you need to put colder sea water in your little spa pool or else risk being burnt! There was more than one occassion when we'd be digging and someone would suddenly squeal and run out in to the ocean doing a little ow-my-feet-hurt dance to cool them down. At first our digging attempts weren't too successful and we started to get a little worried that we'd got too distracted by beautifl deserted beaches and arrived too late. Thankfully a lovely couple let us share their pool! All the boys agreed that half the fun was DIGGING and so the girls left them to fortify the walls against the incoming tide while we soaked ourselves. We discovered that there was a spot (just to our left!) where the hot water was coming from which made it impossible to sit by for too long. However after a while we mastered the skill of digging around where the hot water came from to increase or decrease flow and moderate the temperature. After trying to get as much sand out of our swimmers as possible (quite difficult) we dropped our back packer tag-along off to hitch hike back and carried on towards the famous Cathedral Cove. The beach is in the Te Whanganui-A-Hei marine reserve and the car park for the walk down offered some gorgeous views of the area. Sadly, it also showed me how far down the beach was. I hadn't been anticipating any stair climbing on my holiday, however I'll do pretty much anything to bag a nice snap. I was very excited to spot a silver fern on the way down! After finding about ten more silver ferns we made it to the famous cove itself! Once again another location in the 'Can't Hold Us' video... check out 1.33 for inside the 'cathedral', 3.27 for Opito bay (and the rock!) and 3.38 for the actual beach bit of Cathedral Cove. Yes, I find stuff like this exciting. Look at me putting my hands up/holding the ceiling up. The beach is beautiful. So, so beautiful. The water is so crystal, the rocks are so white and the sky was SO blue! I can, however, only imagine how busy it gets here during the summer. And how hot it would be to walk back up the million stairs to the top. Although it was only after our excruciating walk to the top that Mikey let slip that you can actually get a water taxi to the cove. That was nearly the end of our relationship (just kidding, I was happy to work off a few scallops. Kinda). On the plus side, you can go to a toilet with the world's best view. Yup, that's a lovely beach and Mikey waiting for me to come out. There was even a mini waterfall. Sadly we had to begin our return journey. Mikey stopped to take a picture of this tree root. I pretended he needed to get the perfect shot so that I could have a rest and stop wheezing like a heavy smoker running a marathon. I made it to the top and rather quickly smashed out a big bottle of L&P. For sustenance. Our drive home took us past a famous Kauri Pine. According to Mikey this is a baby one! I was very happy to hug a tree that wasn't crawling with spiders. Needing some proper food for the drive home we jumped in to a 'Fush and Chups' shop. 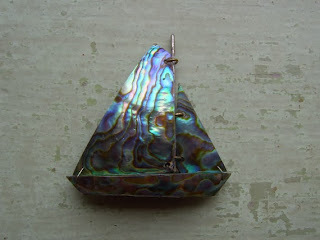 Everywhere in New Zealand you can buy beautiful jewellery made from Paua shell. It's a gorgeous shimmery thing and is used in necklaces, earrings...I even bought a tiny boat ornament with sails made from the shell! You can also eat the flesh inside so imagine my excitement when I saw that the Fish shop sold paua fritters! ...and horribly disappointed when I realised it looked like this. Deep fried troll snot. The taste wasn't too great either. The only way I can describe it is that it tasted like that horrible stale seaside smell you get around marinas. Mikey told me that I shouldn't judge paua on this as it had almost certainly been frozen and horribly processed (I guess don't judge chicken on a McNugget?) but it took so much L&P to wash away the taste that I can say I'm excited about the next time I sit down to chow on one of these! After munching our (tasty) battered fish it seemed prudent to work some of it off. By playing on the playground. Naturally. Sadly we soon had to head back to Cambridge. After a lovely family evening and a very early start the next day we found ourselves back on a plane to Cairns... A week wasn't nearly enough time to explore even a teeny tiny part of New Zealand, I can actually see why people rate it above Australia as a travel destination! Don't worry, we'll be back. Even if our main incentive for coming is to eat ourselves into a sea-food-coma.